Cruise ship passengers spend to take tours on the twin islands. BASSETERRE, St. Kitts — Cruise passenger spending in St. Kitts and Nevis has tremendously increased over the years, registering a growth of 77 percent from 2014/2015 to 2017/2018. Local taxi service and tour operators are certainly reaping the benefits. 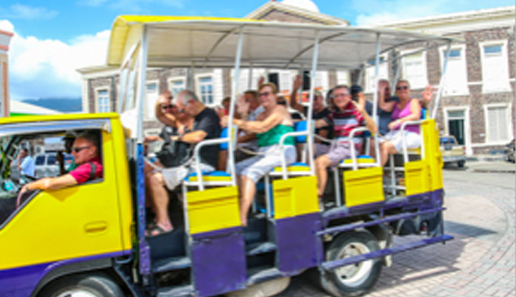 According to the Business Research & Economic Advisors (BREA) 2017/2018 Report – which measures the economic impact of the cruise tourism industry in 36 destinations throughout the Caribbean, Mexico and Central and South America – total passenger spend in St. Kitts and Nevis (2014/2015) was US $75.30 million compared with US $133.02 million (2017/2018). The St. Kitts and Nevis Information Service (SKNIS) interviewed two presidents of the three Taxi Associations in St. Kitts. Both stated that the cruise industry has undoubtedly created jobs for locals. As heads of the two taxi associations, they gave feedback on how the 77 percent increase in passenger spending has benefited taxi operators. President of the St. Kitts Taxi Association, Calvin Leader said taxi service providers have definitely felt the increase in passenger spending. David Brandy, President of the Liamuiga Taxi Association, shared the same sentiments, noting that there has been a “trickle-down effect” when it comes to all service providers in general. The tourism industry in St. Kitts and Nevis will continue to grow exponentially in the upcoming years, said Minister of Tourism, the Honourable Lindsay Grant, noting that locals will always stand to benefit year after year, especially in the cruise industry.